Girls hads to gos to Dentists todays. Bears does nots needs Dentists. Bears eats fishes and uses bones to brushes teeths. Bears sats with Boys while Girls gots her teeths cleaned. 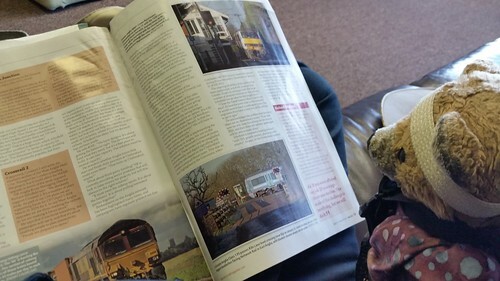 Boys hads a magazines full of trains. Bears likes trains. Bears asks Girls and Boys whens wes wills rides trains agains. They saids this summers, but onlys a little bits of trains. But they saids wes wills rides on a bigs ships, too. Bears has nevers beens on a long boats rides. This entry was originally posted at http://travelswithkuma.dreamwidth.org/82039.html. Please comment there using OpenID.